Over the last few weeks I've been talking with a few guys on my team (@a_robson, @therealhoff, @elijahmanor, @ifandelse) about Distributed Hash Tables (DHT). A DHT seems like a fun thing to build that would be a good fit for F#. I decided to look at starting down the path of implementing the Chord protocol (http://pdos.csail.mit.edu/papers/chord:sigcomm01/chord_sigcomm.pdf). The first problem that needed to be solved was that of communication between the nodes. The ideal solution seems to be the model provided by Erlang. Unfortunately, that model doesn't seem to be available in .NET land (there is MPI.NET, but that appears to require Windows HPC Server 2008 or Microsoft Compute Cluster Server 2003 for use across multiple machines). After some research, I finally decided on using .NET remoting (though I may end up changing this to a sockets based approach in the future). The POC for this is provided below. 1. 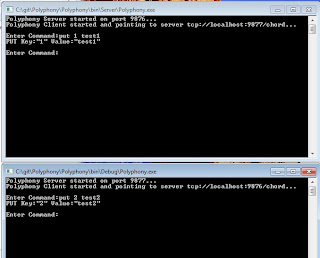 First, run Polyphony.exe from the bin\Server directory. 2. Next, run Polyphony.exe from the bin\Debug directory. 3. Now, type "put 1 test1" in one of the consoles and "put 2 test2" in the other. 4. Now, type "get 1" in either console. The app. will first check it's local hash table. If the value is not found, it moves on to the second node. The next step is to make this scale and more robust. Then it's on to some of the specific Chord protocol functionality. The source is available at http://github.com/dmohl/Polyphony and will be continually evolving. Let me know if you want to participate in the fun. In 2010 - *don't* use .NET Remoting. Please. I'd suggest you use WCF with one of the binary bindings (netTcpBinding / netPipeBinding). :) Point well taken! I will definitely be moving to either WCF or a sockets based approach. "Microsoft HPC Pack 2008 SDK" for the MSMPI implementation and utilities (notably, Microsoft's versions of smpd and mpiexec). Once you have that and MPI.Net, you can build and run your distributed apps using mpiexec to specify which nodes run which processes, and smpd running as the process manager demon on each node (which can be 32 or 64 bit OS). Great to know! Thanks David!